The entire look of the film was accurately lush. The costumes were period accurate and beautiful. A House Divided doesn’t make the mistake of blurring the fashion into one block of unrecognizable historical fashion. However, the fashion accurately portrays the period that the story occurs in. As time progresses and the characters grow older the fashions correctly followed. Beyond the clothing, the hair and makeup were also top notch. This film takes place over about 40 years, with the earliest period showing Julia as a spunky 13-year-old in the 1840’s. Both the hair and makeup show this transition very naturally. As much of the story is told using flashbacks getting these character transformations seamless was necessary. The transitions were artfully utilized to stitch the story together as the characters are willing or made to reveal the truth of what happened. Much of the progression of time was believable because the actors effectively changed their voices and demeanor to fit the characters as they grew older. LisaGay Hamilton masterly plays both a 12 year old and a 49 year old. Additionally, all the actors were solid in their accents. LisaGay Hamilton shines as a quick-witted enslaved woman. Julia knows that she’s intelligent, but she also knows what that means for her as an enslaved girl and later woman. 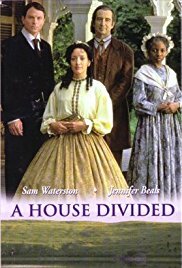 Jennifer Beals is perfect as the pampered Southern Belle Amanda America Dixon. I really appreciate how both Julia and Amanda were given voices of their own. Many a lesser film would have made David Dickson the center of this film. However, this film forgoes that by giving us layered insight into the feelings and thought processes of both Julia and Amanda. I was pleased that Julia wasn’t just a stock character. A sad black slave mother. Julia was much more. She was a spunky teen that grew into an intelligent driven woman. She had motivations as well as ideas about what she wanted for herself and her daughter. The same can be said for Amanda. 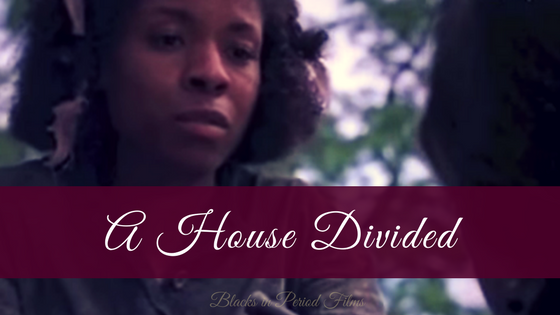 A House Divided gave Amanda determination, strengthen of character, and a resolution that allowed her acceptance of both parts of herself. Both writing and acting took Amanda’s story beyond the tragic mulatto trope. This film does not end with a sad and tragically broken mixed-race character. We are instead left with a character who has grown to love and accept themselves fully. A House Divided isn’t a story of tragedy; it is one of triumph. Some online commenters about the film stated that they had to suspend their belief to follow the film. Some did not believe such a case would have occurred and others felt it was unrealistic to have David Dickson, a white father leave his mixed-race child anything let alone such a large portion of his estate. I am not sure if these people did not know the film was based on a real person. Or if they knew, but thought the story was embellished upon. However, while there are some areas of the film that were embellished upon for dramatic effect. It was not the court case or will that contain these inaccuracies. There are many examples of mixed race heirs and heiress in the 18th and 19th century, like Robert Purvis, Cecee Macarty, and Margaret Ann McDougall. Additionally, the case shown in the film did occur and with similar results. The inaccuracies lie in Amanda’s relationships. In the film Amanda elopes with a white Confederate soldier named Lt. Brookes after being told not to. However, at the age of 17 real life Amanda married her white first cousin, Charles Eubanks. The couple went on the have 2 sons, Julian Henry and Charles Green. The marriage was unhappy, and Amanda left Charles in 1870, and returned to her family home. I prefer historical accuracy but understand why the writers choose to forgo the ill-fated cousin marriage and went for the handsome doting beau instead. Although the film was not entirely accurate, the choices made in the name of creative liberty were well throughout and excellently crafted entraining story and character arcs. The costumes, writing, music, acting, and use of history were awesome. If you want to watch a heartwarming family and courtroom drama A House Divided is the film for you. I highly recommend A House Divided.